Once again I’m much too late. My original plan was to publish this post with the release of the soundtrack album (October 19th) or at least the film premiere (October 23rd). Then I aimed for the anniversary of Freddie Mercury’s passing (November 24th). And after that I even missed the glorious Golden Globe triumph. Somehow I just don’t have it with deadlines. But to be honest, I’m glad I even made it at all, because for a while things didn’t look too good. 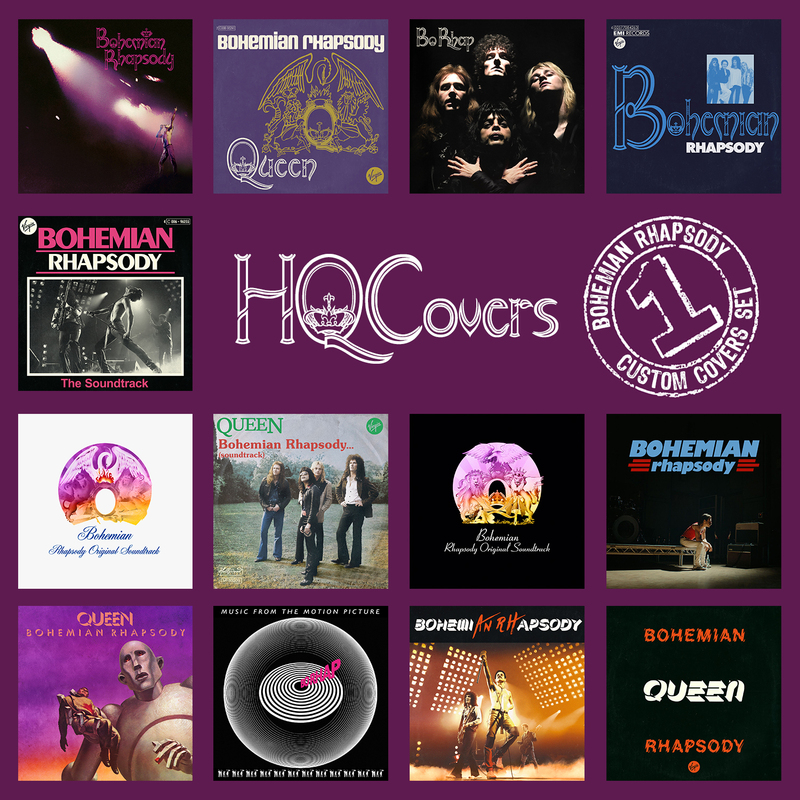 The idea of making a tribute cover series for Bohemian Rhapsody came to me fairly early, sometime in spring. 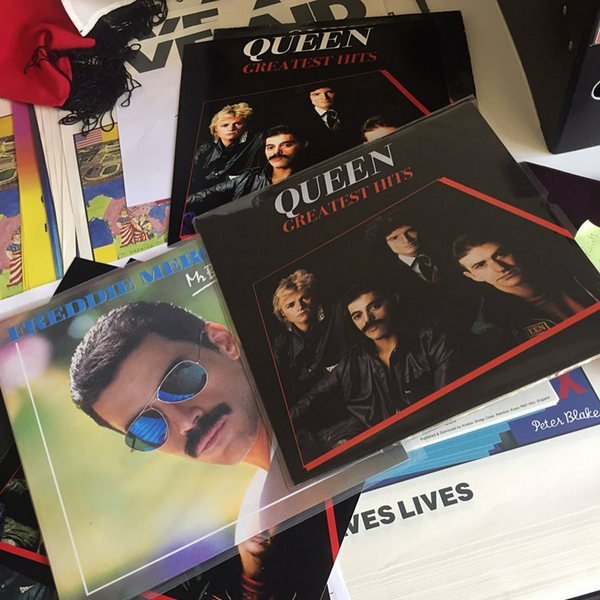 Especially after all those tribute frenzies of the past and also because I’m a die-hard Queen fan since 1989, when me and my brother purchased The Miracle on cassette from a music salesman who one day out of the blue showed up on our doorstep. We’ve been collecting all of their stuff ever since and I’m still absolutely in love with their music. After all, I’ve been listening to Queen nonstop while making this series (which roughly makes up the last three months) and I haven’t got tired of them. YouTube has turned into a Queen video portal for me and my Last.fm charts are made up of Queen tracks entirely by now. Even my 7-year old daughter got hooked, as I caught her singing along to We Are The Champions all by herself (magical, I tell you!). But above all I kinda rediscovered the old 70s albums for me personally, with all their versatile songwriting and insane multitrack work. The band amazes me even more now as individual musicians and I was desperate to do them justice with these custom covers of mine. My plan was entirely based on the premise that 20th Century Fox would launch a major advertising campaign and publish lots of awesome posters. But somehow they didn’t do that. It was a lukewarm marketing launch at best and my mapped out plan ended up in smoke. Don’t get me wrong, the filmmakers did an excellent(!) job recreating Queen as a band, both on tour venues and in video shoots. We could marvel at numerous faithful costume and set recreations and were amazed by authentic 70s and 80s TV aesthetics. They even managed to incorporate lots of original typefaces into the music montages, which of course made me particularly happy. But when it comes to faux album covers, there supposedly was just one scene and that one sadly didn’t make the final cut. I felt compelled to change that and when I realized that I didn’t have to rely on existing marketing material, but could just come up with my own (using photos and screencaps), I was sold! 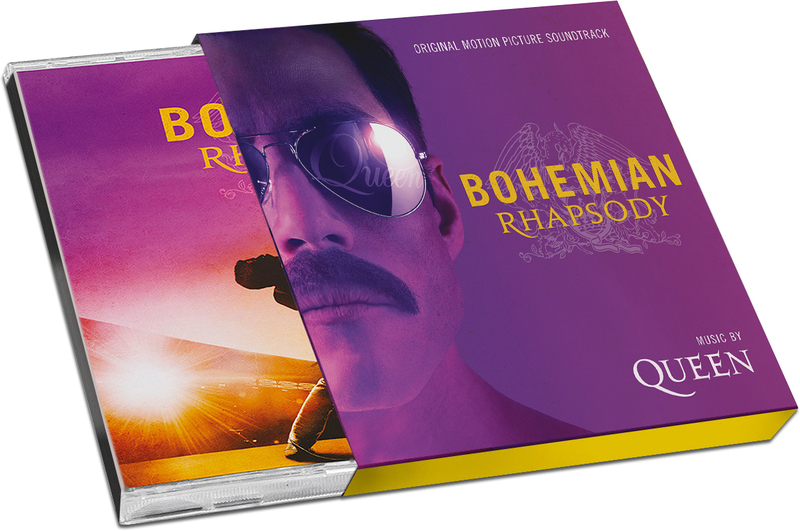 I went out and purchased the official book of the movie solely for this custom covers collection and also learned that there’s a whole army of Queen fans out there that has re-created all kinds of fonts, logos and whatnots, all of which were extremely helpful in the making of this dazzling collection. What you see below is more or less the entire discography of the band, wringed through the Bohemian Rhapsody filter. Most often I heavily relied on font design, sometimes I really had to flex Photoshop’s muscles and a few times I just changed the colours to those of the movie poster. 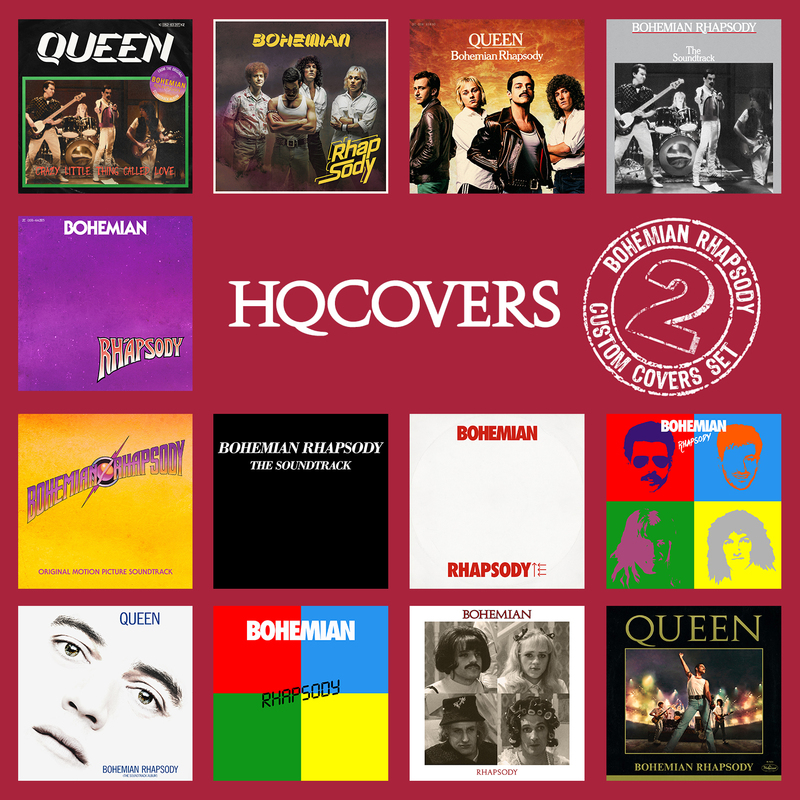 By the way, I’d like to apologize for having completely skipped the penultimate album Innuendo, but I just couldn’t think of a way to BoRhap-ify it properly. I guess if I would have spent another one or two weeks on this project, some ideas might have emerged, but who would want that? It’s enough already, isn’t it. A few final words about the film: I absolutely loved it! It was unexpectedly funny, beautifully designed and it really captured the different eras of the band. It was truly magical to re-experience scenes I remember so damn well from those old band documentaries that we’ve had on VHS. And the cast, that bloody cast, oh my God! Gwilym Lee looks and sounds exactly like a young Brian May, it’s bonkers! And I love how Joe Mazzello plays John Deacon as the coolest, most laid-back dude ever. And then of course there’s the magic of Rami Malek… oh boy, he surely is in a league of his own. And he better damn-well gets that Academy Award. What a performance! This once-in-a-lifetime cast and the fact that they also used the talents of a certain Marc Martel make me absolutely sure that there was no better time, no better place, to make this film finally happen. All those years in development hell, it was all for good. The proof is right up there on the silver screen. For social media promotion I sometimes come up with special banners or posters which offer an overview of my work and hopefully encourage people to visit my blog. 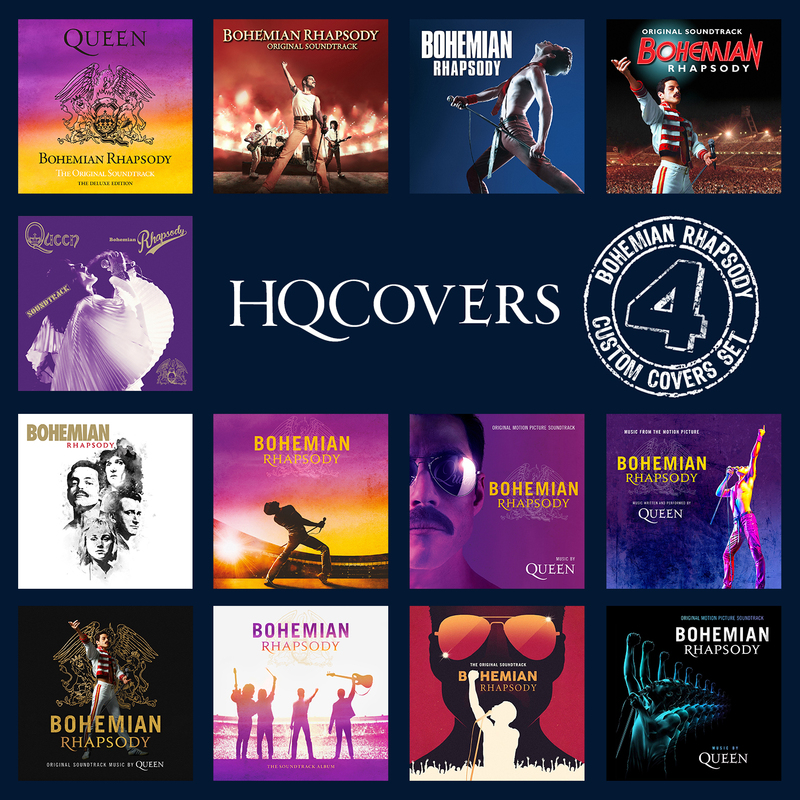 For Bohemian Rhapsody I stuck with the concept of tribute covers and turned Queen’s 2008 The Singles Collection into advertisements for my very own cover artworks. Ha! “Bohemian Parody” should have been the title of this post… love it! Amazing what you managed to do with the footage! And I agree that the movie was great, even if they bended some facts for movie purposes. 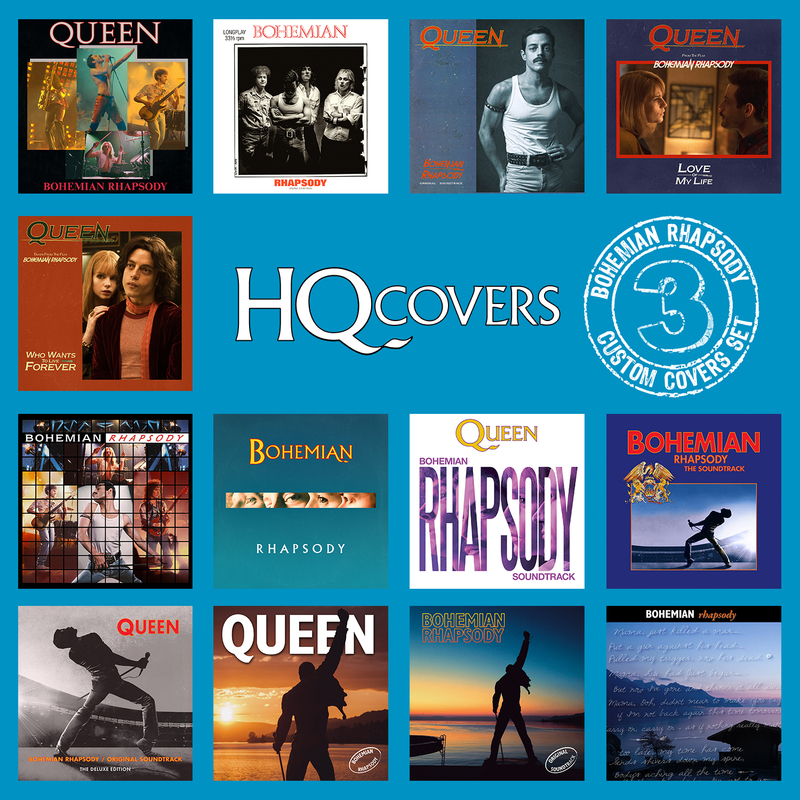 Its exhausting just looking at all those covers (in a good way). I cannot imagine all the time and effort you put into them. Brilliant, well done!. Thank you and I can understand your feeling, it was kind of exhausting to make them too (but also in a good way).